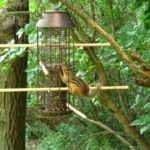 Eastern Chipmunks inhabit most of eastern North America including southeastern Canada, Minnesota, Wisconsin, Iowa, Illinois, and Michigan. Eastern chipmunks have excellent vision, hearing, and sense of smell. They communicate with each other by making a variety of sounds, including the ‘chip’ for which they are named. 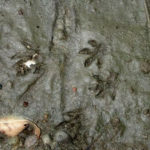 They may disperse the seeds and bulbs of the plants that they eat and aerate and recycle soil as a result of their burrowing. They can be a menace to your gardens and landscape. Eastern chipmunks live in shallow burrows in the ground. They are partial to areas near rocky crevices, decayed tree trunks, and fence corners. They do not like dense forests where no sunlight reaches the ground. Burrows are made by digging and carrying away the dirt in their pouched mouths. 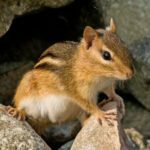 Unlike prarie dogs and other sciurids, eastern chipmunks do not leave the dirt in mounds near the entrances of their burrows. 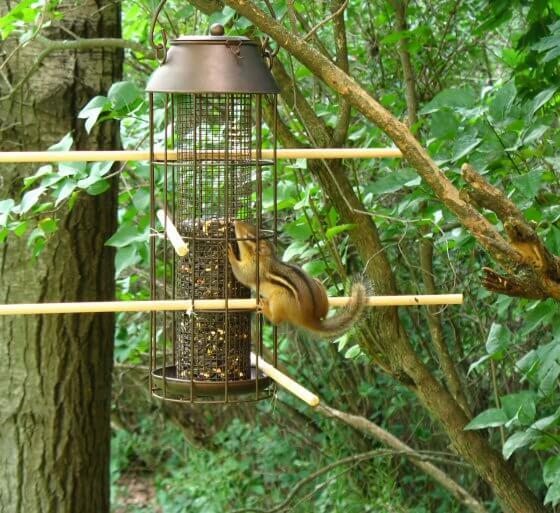 This makes it harder for predators to find chipmunks in their homes. These burrows can be up to 30 ft. in length with several different exits and tunnels. Eastern chipmunks conceal the exits with leaves and rocks. They may inhabit these burrows for several years. Perhaps the most distinctive characteristic of all chipmunks is their pouched cheeks. The pouches are located in the sides of their mouths and are used to store food. When the pouches are full they can be as large as an entire chipmunk’s head. Eastern chipmunks are larger than most chipmunks. 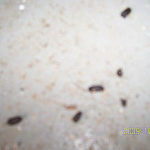 They are reddish brown in color with 5 black stripes on their backs. These stripes are separated by brown, white, or grey fur stripes. They also have white and dark markings around their eyes. The stomach is usually a yellowish brown or white color. Their tails are reddish brown and furry, but not bushy like common squirrels. 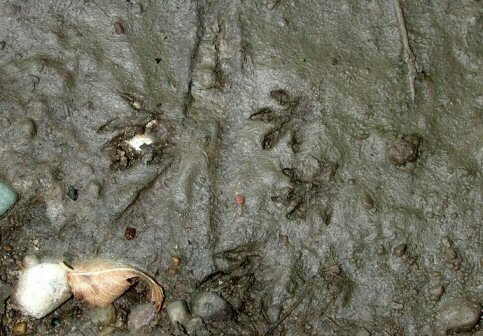 Like many rodents, Tamias striatus has 4 toes on the front feet and 5 toes on the rear feet. 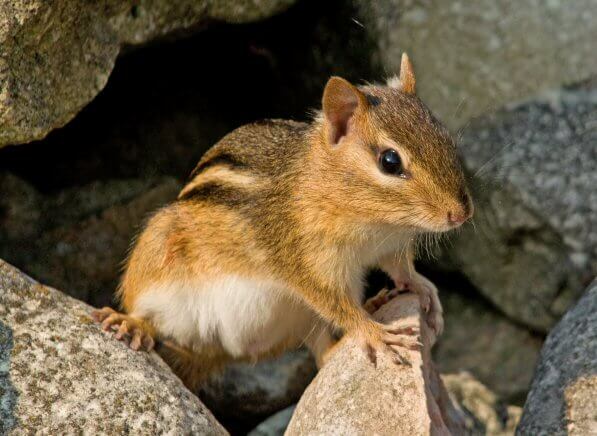 Eastern chipmunks are usually solitary animals that defend small territories around their burrows. There is considerable competition during the mating season for estrus females, but even if a male outcompetes his comrades the female may reject him by biting him and chasing him out of her burrow. Although Tamias striatus are solitary animals, they have been seen gathering to “sing,” or make noise in chorus. They also make a variety of other noises. 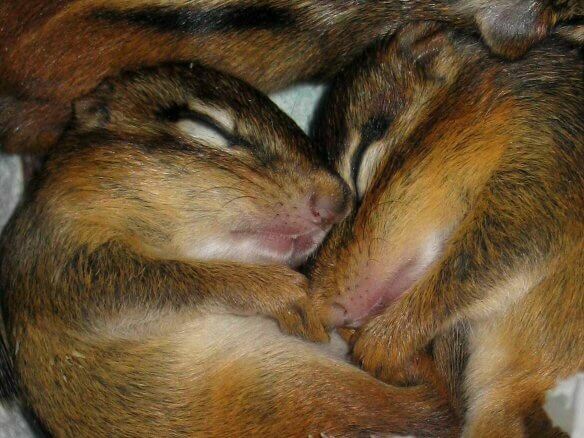 The name chipmunk comes from the noise “chip, chip, chip” commonly made by these furry animals. 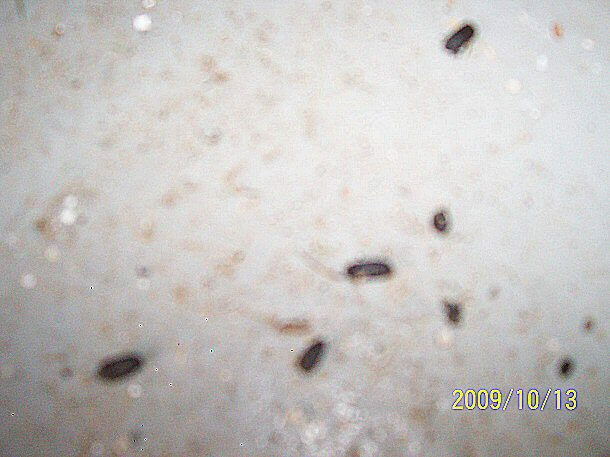 Many kinds of sciurids hibernate during the cold winter months. 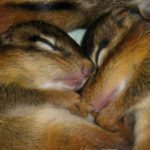 eastern chipmunks, however, do not hibernate continuously through the winter, nor do they “fatten up” before retreating to their burrows. They keep large stores of food in their burrows and build nests on top of this treasure. During the winter months they wake up periodically and snack on their stored nuts and seeds.